Meet Jacob Waltuck, an employee at a New York prop shop, whose Autism enables him to excel at his job. In this newly debuted video, “Employing New Sources of Talent”, created by the F.B. 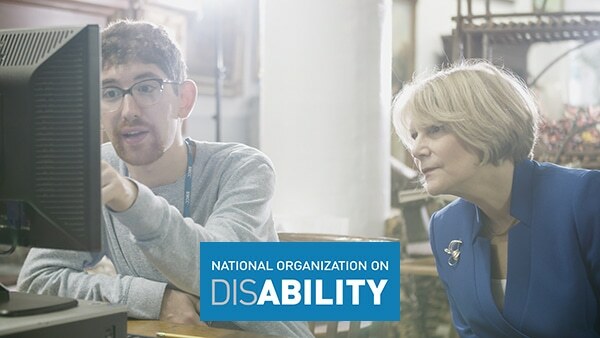 Heron Foundation, NOD President Carol Glazer and Jacob sit down for a candid discussion about how he contributes at work and his love for his job—and how the talents Americans with disabilities offer are proving to be a benefit to employers. This video is one in a series commissioned by the Heron Foundation as part of a campaign, Poor U.S.: Reimagining a Path to Prosperity, which recasts the narrative around what it is to be poor in the United States and suggests ways to reinvent the economy to provide paths to prosperity. Tapping new sources of capable, motivated talent – people with disabilities – is one. The National Organization on Disability is partnering with leading brands to promote job opportunities for the 30 million working aged Americans with disabilities. Watch the video on the Heron Foundation website.